Offering a cool toned metal that is strong and versatile, platinum engagement rings are practical, elegant and eye-catching. This metal has many unique properties. It is fully hypo-allergenic, meaning that it can be worn even if you have a known reaction to certain minerals. This metal does not fade, either, or chip easily. Needless to say, all of these factors are helpful when it comes to a piece of jewellery you will wear for the rest of your married life. What makes platinum engagement rings so spectacular? Have a look at these amazing rings, and you will soon see just what this metal has to offer. 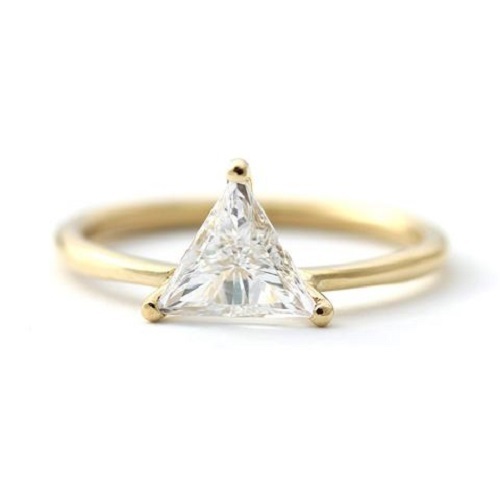 Marquise rings are flattering, especially for those who have longer fingers. The symmetrical tapering on both ends adds to its sense of balance. Tiny pave stones meanwhile form a halo around the centre stone, with platinum offering the perfect cool tone to offset this elegant design. 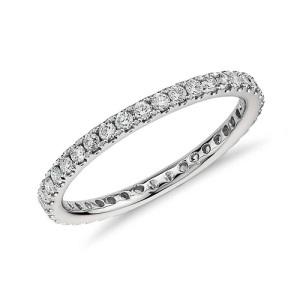 The gentle twist of this band helps to accentuate the centre diamond without taking away its full appeal. Although this style works well with classic white diamond engagement rings, it can be equally lovely with a coloured or black diamond, or a stone such as morganite, ruby, emerald or sapphire. Three stone rings are timeless, classic and flattering for everyone. This style has plenty of symbolism, making it ideal for romantics. The three stones are said to represent the past, the present and the future, which is perfect for your journey together as a married couple. This style works well with any cut. 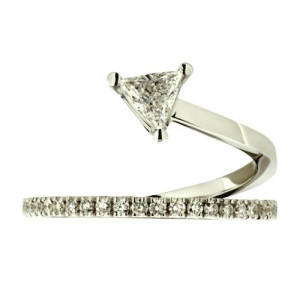 A tiny princess cut stone helps to add subtle sparkle, while allowing the reverse split bands to highlight the stone. A round cut diamond, sapphire, ruby, emerald or even an opal or pearl would also work well with this style. 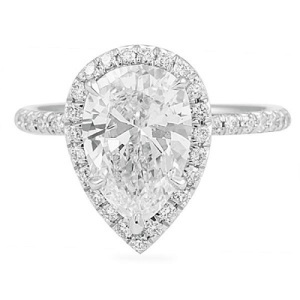 Pear shaped diamonds are romantic and bold, yet not overly so. The gentle taper of the pear can be faced towards you or away from you, adding the illusion of length in fingers. Pave stones help to add extra sparkle from this cut, working especially well when off-set against the cool tone of platinum. Not really a huge wearer of jewellery? Eternity rings can also work well for engagement, offering a subtly sparkling band that can be stacked with a wedding band. Tiny pave stones are used to create sparkle. Tiny baguettes can also be set into this style of band for a bit of interest. Split band rings continue to be a popular choice, working well in modern and vintage inspired ring designs. The two bands connect at the back of the ring, splitting to frame the centre stone. Although round diamonds look best in this style, it also works with heart shaped stones, emerald or princess stones or even something modern like a trillion cut stone. 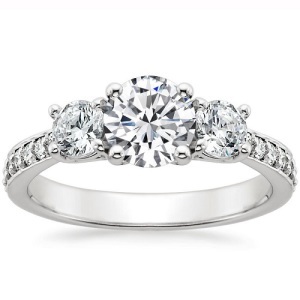 Looking for a perfect platinum ring? 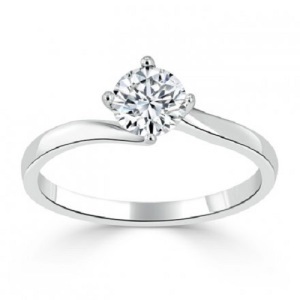 Browse our selection of platinum engagement rings, or contact us with any queries about ring design in South Africa. Not sure what that engagement ring term really means? Shopping for your dream ring can be confusing at the best of times. With so much variety on offer, it can be hard to know where to even begin. It gets even more confusing when you hear so many terms relating to styles and cuts. To help you get a better idea of what terms are often used when referring to rings, we have put together a short engagement ring glossary. Emerald. Emerald cut stones are unique. Rather than facets, they have step cuts on the pavilion and a large, open table. Rather than sparkling, the effect is a hall of mirrors, with light and dark rays clashing to add a huge amount of drama to these rings. Baguette. These can also be called emerald in that they are also rectangular with a flat top and step cuts. Baguettes are typically longer and a bit thinner, taking their name from the French loaf of bread. These stones are often used in 3 stone rings to flank a larger stone. Asscher. The asscher cut was first created in 1902, by the Asscher Brothers of Holland. This style inspired the emerald cut. It has a similar cut to emerald, but a square shape instead of a rectangular one, and larger step cuts, a higher crown, and a smaller table. The result is more sparkle than the emerald cut. Trillion. 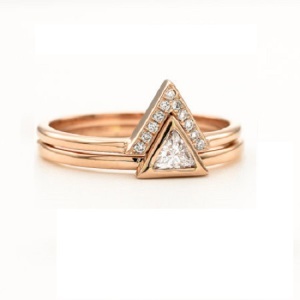 Trillion rings are triangular in shape, with three sides. There are a number of styles available within this cut, some with rounded corners and others with sharper corners. They are also used as side stones. Split shank. The band of these rings are split, usually alongside the centre stone. The result is a gently flowing band that opens out to showcase the stone more effectively. 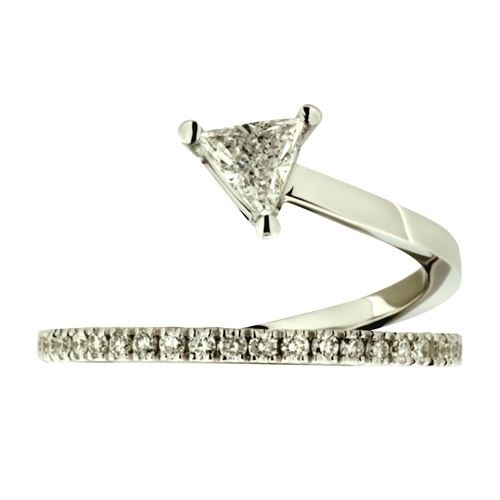 Split shank or split band rings often feature pave stones. Pave. Pave stones are tiny diamonds that are set into the band of a ring, or in a halo shape around a centre stone. As the stones are so small, it can often be more affordable to include a few pave stones and a single larger stone. Halo. 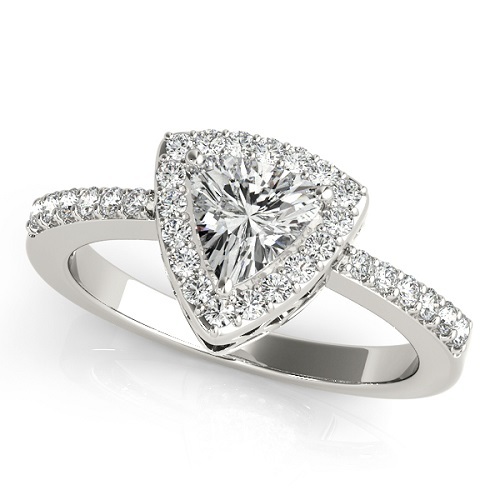 This style features a centre stone that is ringed in tiny pave stones. As a result, rings in this style are especially brilliant, with light reflecting off the main stone as well as the tiny pave stones encrusted in the band. Princess. The princess cut was first created in 1980. Today, the princess cut is one of the most popular diamond shape. It is not quite square, and not quite round either. Instead, it is has a soft rounded square shape that is surprisingly flexible. Cushion. 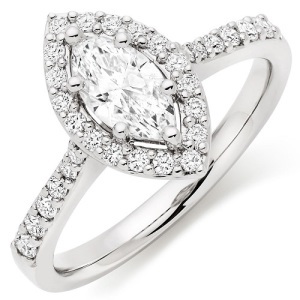 This style is very similar to the princess cut, with a rounded square shape that has no sharp edges or angles. This cut has been popular for many decades, offering a versatile cut that works well in most styles. Marquise. 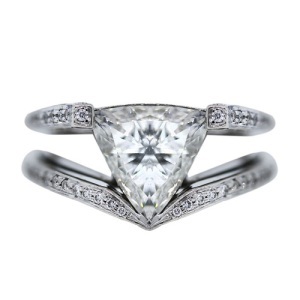 The marquise cut is symmetrical yet gently curved. With a football shape that is tapered at both top and bottom, and a wider middle this style is popular in art deco style rings. It gives the illusion of size, working well for those who want maximum impact. Solitaire. This simply means a single stone. Solitaires are often set simply, in a prong. Modern styles can be set into the band as well. Solitaire stones are not flanked by any other stones. Instead, the stone sits on its own, adding plenty of impact. Radiant cut. Somewhere between cushion and princess cuts, the radiant cut diamond has a rectangular cut that is applied to its crown and pavilion, resulting in a sparkly, lively diamond. This style works well when set with rounded or squared corners. 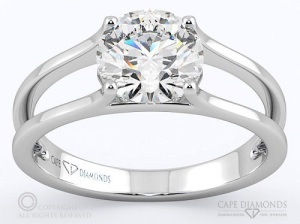 Get in touch with Cape Diamonds today to learn more about our unique approach to engagement ring design and craftsmanship! If you prefer engagement rings that have a modern style, trillion cut rings are sure to be a good choice. This cut has a triangular shape that elongates your finger subtly without looking too bulky or long. With three equal sides, and 31 or 50 facets that depend on whether the stone is used as solitaire or side stones, this cut comes in a wide range of styles. Some trillions are smooth cornered, while others have sharper edges. Whether used in a contemporary design or something more classic, trillion cut engagement rings are stylish and elegant. Be aware however that this cut can be prone to chipping at its edges. If you live an active lifestyle or you have a job that requires you to get your hands dirty (literally and figuratively), it may be best to consider a cut that will not chip. If you know that you will keep your ring safe, however, keep on reading to see what this cut has to offer. Pave rings are always stunning, whatever the style. In the trillion cut, pave stones add even more sparkle, helping to catch the light and add a touch of elegance. Pave stones can be placed on the band or just around the stone in a halo style. Whichever way you prefer, this ring will appeal to those who love classic styles. For a modern take on pave, you could also consider a double band. This style works especially well for those with longer fingers. As the ring is larger than most, it may overpower someone with small hands. You can keep the metal in platinum, or add even more impact with yellow gold or rose gold metal. Brides to be who prefer an understated look will love this delicate, minimal ring that is set on simple prongs on a fine band. Although this ring looks lovely in yellow gold, it would be equally beautiful in rose gold, platinum or even a coloured gold that adds a bit of drama. Likewise, you could choose any stone you prefer. Not sure which to choose? What about a birthstone engagement ring? 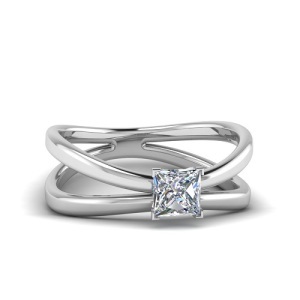 This bridal set includes a stacked engagement ring along with a wedding band. 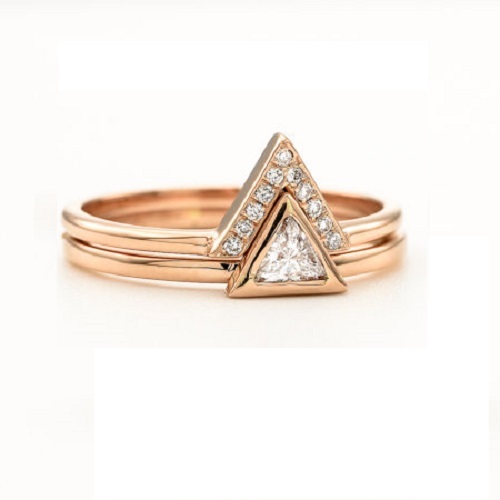 The triangular shape of the trillion cut makes it ideal for geometric stacked styles. This ring would work well in any choice of metal and stones – even in contrasting two tone metals such as rose gold and platinum. Brides that like things a bit more unique will love this incredible winding ring that features a solitaire stone in a twisted pave band. This style is bold yet not overly fussy. The tiny pave stones and delicate band help to highlight the stone without overcrowding it or taking away from its subtle appeal. For those who prefer something more traditional, trillion style stones also work very well as side stones that flank a solitaire in a 3 stone ring. 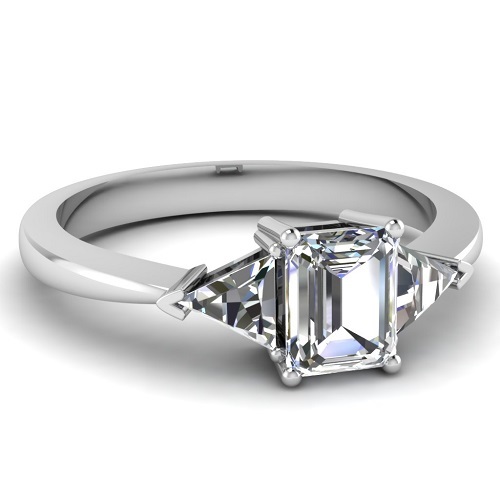 In this style, the triangles help to position the centre stone without stealing the show. The result is a classic, beautiful ring that has endless charm. Dreaming of a unique custom designed ring for your wedding? Contact Cape Diamonds today to learn more about our tailored engagement rings that are made in Cape Town, South Africa with love.